Controversies still exist about the indications in using the different materials and principally about the biological ones. Potential or certain contamination of the surgical wound poses a dilemma as the use of nonabsorbable synthetic material historically is considered contraindicated, given the risk of postoperative infectious complicationsand need for mesh removal. The introduction of biological prosthesis (BP) has provided an alternative. Either allograft or xenograft, BP might be better able to tolerate bacterial contamination and have a lower incidence of surgical site infection. 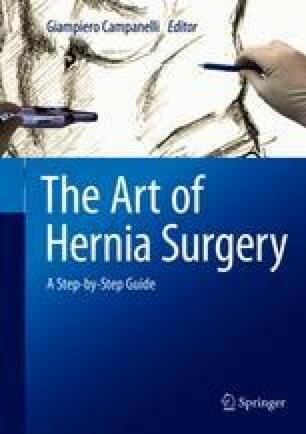 Furthermore, the complexity of hernias could derive also from tissue loss, dimensions, anatomic position and clinical or pharmacological data: based on pathophysiological characteristics, BP could act as a valid alternative not only in contaminated fields. It is likely to extend their possibilities of use in uncontaminated fields: the BP remodelling process would be favoured not only by its intrinsic characteristics but also by a less pronounced inflammatory reaction in respect to their use in contaminated fields. In contrast to current nonabsorbable prosthetic repairs, where the prosthesis is intended to strengthen the defect life-long, the extracellular matrix of BP implanted into the host has a direct strengthening function only initially. Subsequentially, the matrix is gradually degraded while inducing neovascularization and colonization by host cells that progressively cause a site-specific remodelling process until the reconstruction of a new and mature autologous fascia is complete. The proposed advantage of BP is that the patient’s immune cells can infiltrate the material to defend against the bacterial load and eventually replace the biologic mesh with the host tissue. The best operative solution for hernia repair in clean, clean-contaminated and contaminated wounds and in emergency hernia surgery remains not clear. However, the price of biologic grafts has caused an alarming increase in the cost of abdominal reconstructions. Actually, despite the risk of infections, mesh reinforcement continues to play a critical role in hernia repair, and biologic materials are often promoted for the use in “difficult” situations, especially those with contaminated or infected fields. Gruber-blum S, Brand J, Keibl C, et al. Abdominal wall reinforcement: biologic vs. degradable synthetic devices. Hernia. 2016. https://doi.org/10.1007/s10029-016-1556-9.